At Zambeza Seeds, we enlist the newest technologies to constantly improve on our methods. In addition to providing customers with high-CBD, non-psychoactive oils, we are proud to feature a full spectrum of naturally occurring terpenes. Not only does this improve the efficacy of CBD, it adds a pleasant aroma and taste to our oil. Zambeza 4% CBD oil undergoes a proprietary purification process, which removes any lingering presence of psychoactive cannabinoids, as well as unsavoury plant matter, chlorophyll and waxes. In addition, the oil is tested throughout every step in production to make sure there are no chemicals or unnatural fertilisers in its contents. As a dietary supplement, our 4% oil has no adverse side effects and can be taken with peace of mind. We never cut corners to provide customers with high concentrations of CBD - that is why we will never use pure CBD crystals, which forgo quality in favour of speed. 4% CBD oils undergo a clean extraction process that harvests CBD and retains other essential cannabinoids, which make our oils most effective. This is best summed up by "The Entourage Effect," which explains how CBD works better with other cannabinoids in tow than it does on its own. 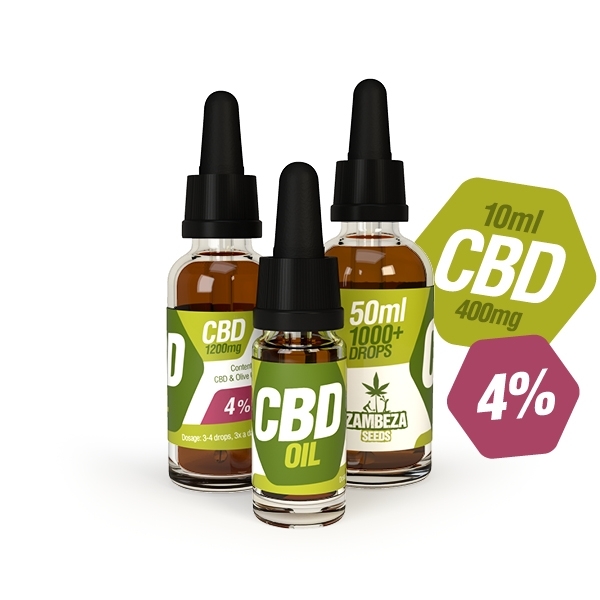 Zambeza 4% oils are fully decarboxylated, turning inactive acid precursor CBDa into the effectual CBD. Our convenient dropper bottle makes dosing an easy venture. Oils flow at an even liquid consistency, ensuring you'll get the most oil possible from your bottle! At first, we recommend taking 3-4 drops under your tongue, or on top of food, 3 times a day. From here, customers can increase or change their dose after becoming familiar with the benefits of CBD. Since our 4% CBD oil does not contain any preservatives, this product is best stored in a cool, dark place such as a refrigerator.